On Monday I heard Gov. Mike Huckabee give his radio thought for the day concerning the president and his weighing in on the George Zimmerman verdict. In that address the former Governor of Arkansas made a unique and really interesting analogy about president Obama. He said when the country seems to be divided and the rhetoric heats up like it did when the Zimmerman verdict was announced, the president could have taken one of two positions. He could have been a leader and try to cool down the rhetoric or else he could have not led but instead kept the heat up. The analogy he used was that the president can be like a thermostat or he can be like the thermometer. He said a true leader would be the thermostat and try and cool things down when the people are divided and the temperature of the country rises. Gov. Huckabee said this president on the other hand was acting like the thermometer as he watched the temperatures rise in the country he didn't jump in to cool things down but kept the heat rising with his personal racial comments. I agree with Gov. Huckabee that that is not what the country needed at the time from their president. [Paraphrasing Mike Huckabee] president Obama should have used this opportunity to be the thermostat [be a leader] and he should have tried to cool the temperature of the nation down by telling the nation that there was a fair trial and the jury has spoken and now is the time for the nation to come together. The president could have said that, 'while we have come a long way in race relations there are still divisions that occur and that can be discussed, but not in terms of this trial as this case was not about race. Yes, a true leader would have said that. If only we had a true leader as president. To me the president has never acted like the thermostat to try and cool things down and bring the country together but always acted to apply the heat to exacerbate divisions among the people to take advantage of those divisions politically. 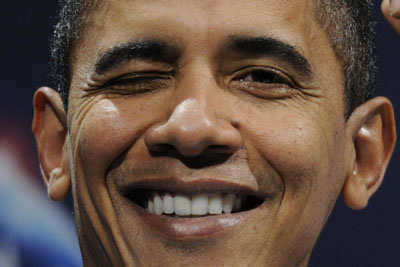 This president will never go down as a great leader but rather as the most divisive president in our nation's history. It's hot in here--let's see if I can make it hotter.